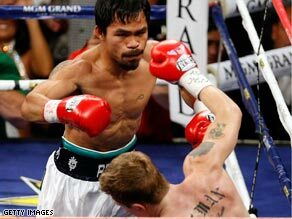 (CNN) -- Ricky Hatton will aim to become the world's top promoter if the British fighter decides his crushing two-round world title defeat by Manny Pacquiao was his last fight appearance. Hatton heads for the canvas in a Las Vegas encounter that may have been his farewell apearance. Hatton is contemplating whether or not to call it a day after having his IBO light-welterweight title ripped from his grasp by the Filipino in Las Vegas. "I really don't know at the minute because I never thought that (the second-round knockout) was going to happen," Hatton told Sky Sports when quizzed about his ring future. If he decides to follow trainer Floyd Mayweather Snr's advice that the Mancunian should quit, Hatton has planned his next avenue of attack. Hatton Promotions already exists and the man they call The Hitman promised: "People are still going to see plenty of me. "I'm going into promoting now and I've got a future with the youngsters. They are going to be fulfilling my dreams from here on in. He added: "I've worked with so many promoters and I believe I can do a great job at it. I believe I've been a great world champion, the best in the world. "I believe I can be the greatest promoter in the world, that's the next avenue down which I'm going to go. "But as far as physically boxing myself, I don't know what I'm going to do at the minute." Hatton's preparations for the Pacquiao clash have been called into question, and the 30-year-old admitted there were issues in the build up to the fight. "There was things that could have been different but I'd rather not talk about it," he told Sky. "I've lost twice and I've lost to the best pound-for-pound fighters in the world, it's not a bad way of looking at it, but I'm devastated. I would not have put my money on that happening." Hatton will pocket more than $8 million as a consolation for his humiliation. Floyd Mayweather Jr., who beat Hatton in another 'superfight' at the back end of 2007, chose Saturday night in Vegas to announce he was coming out of retirement. Mayweather, nicknamed 'money' because of the enormous revenues he generates, will face Mexico's Juan Manuel Marquez on July 18 in his return to the ring. But the talk of the boxing world is an eventual match up against Pacquiao with the notional pound for pound title at stake as well as a massive pay day.